Established in 2000 by a group of veterans in the lead acid battery industry, NorthStar quickly became an industry leader in designing, manufacturing and deploying an innovative range of batteries and site solutions. NorthStar employs over 600 people worldwide, with offices in Sweden, USA, China, Dubai, Panama, Brazil, Singapore and Malaysia. NorthStar products are designed to be ultra high performance and premium quality, with a much longer lifetime than standard products. What puts NorthStar so far ahead of the competition? NorthStar batteries are used in more than 120 countries around the world. Each country is different in terms of grid availability, operating temperatures, and power requirements. Even in developed countries with very stable grids, power failures can strike at any time. 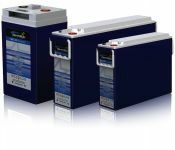 NorthStar used its global experience to develop batteries to suit every environment and requirement. The NSB Red Battery® uses pure lead technology to provide high energy density and an extended float life of 15+ years, even at elevated temperatures, which dramatically reduces maintenance and replacement costs. The NSB Blue Battery® recharges up to five times faster than standard AGM batteries, with PSOC compatibility for high cyclic performance - perfect for unstable grids or off grid applications such as hybrid gensets. The NSB Silver Battery® is a premium, high density designed to offer ten to fifteen years of trouble free service in standby emergency power (float) applications. They are best suited to deliver high power and cyclic capability in semi stable grid applications. State-of-the-art construction and automated manufacturing ensure consistency and reliability, with operating temperatures of -40°C to +65°C. OFF-GRID solar power plants require battery storage in order to operate during low light conditions. is unreliable, suffering frequent power outages every day. This means daytime recharging, and nighttime discharging which is severely shortening battery life. The NSB Blue Technology® offers recharge five times faster and can handle more than three times as many cycles than standard AGM's, thanks to its PSOC compatibility. This not only ensures a more reliable power supply, but also reduces the cost of operation. NorthStar Battery has pushed the limits of battery design with the innovative NSB 210FT Blue+ that delivers 10% more backup power in the same footprint as a 190FT. The NSB 210FT Blue+ uses a unique 23” case and handle design that frees up space for more of NorthStar’s proven AGM thin plate technology, setting a new standard for high energy density 12V telecom batteries.